The Marketplace Grill and Cafe is not explicitly a Greek restaurant, but there are many Greek options in its menu, with saganaki, pita bread, feta cheese, and Greek salads. 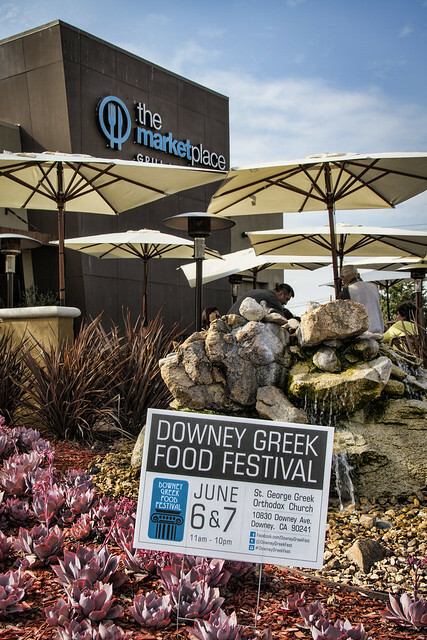 So it's not surprising to see this poster in support of the upcoming Greek Food Festival (one of our favorite annual Downey events!) posted front and center. Sounds tasty. I have spent a lot of time at Greek places out in the Greek archipelago. Authentic Greek -- sounds awesome!